eBook PDF (146 Pages, 3.3 MB), Kindle, etc. With the fragmented landscape of mobile device platforms, tools for creating cross-platform apps have sprung up as varied and numerous as apps themselves. Most of these tools create their own APIs and translate them into the mobile platform APIs, which works fine for some. And then there's Xamarin.Forms, which creates mappings from its C# classes and controls directly to the native platform APIs and controls. 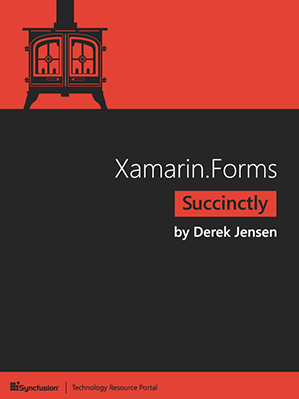 With Xamarin.Forms Succinctly by Derek Jensen, you will learn how to use Xamarin.Forms to build a common code base that can be deployed to iOS, Android, and Windows Phone devices, coming as close as possible as to the mythical "write once, run everywhere". You'll also learn how to build UIs with some of the 40 controls included in Xamarin.Forms, and even how to access native APIs that aren't exposed by Xamarin.Forms.